If you didn’t notice, I love my Pressure Cooker. I don’t have the Instant Pot name-brand appliance, but they’re all pretty similar. I purchased a stainless steel insert for mine though, because I didn’t like the non-stick one that mine came with. One day I’ll get a bigger, better one. I have found a new dish I love. I’ve made it 3 times now, and have tweaked the original recipe to my satisfaction. 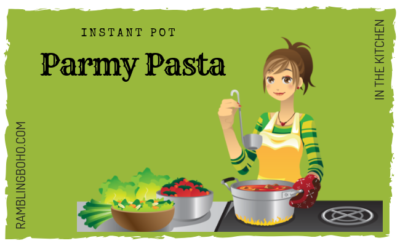 It’s a pretty easy recipe, like most with the Instant Pot. I like easy, which is why this is my favorite appliance. I have to say, it’s kinda addictive, and I just ate too much…. I really shouldn’t have had those seconds. Who am I kidding. Of course I had to have seconds! If you want saucy noodles, use the half a box of noodles (8oz), if you want a dryer noodle, use a whole box (16oz). Both are totally yummy. But I like the saucier one better. Break the vermicelli into thirds. On Saute mode, add the olive oil. When the oil is fully heated, saute the garlic for a few seconds. 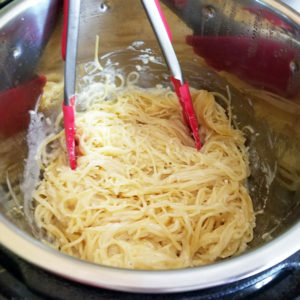 Add the chicken broth or water, heavy whipping cream or Half & Half, garlic powder, lemon juice, salt, black pepper, vermicelli and Parmesan cheese. If the noodles aren’t totally covered, add a bit more broth. 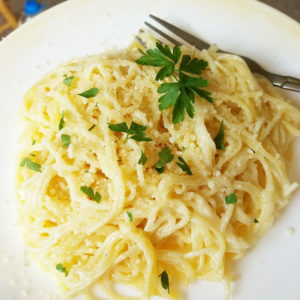 Garnish with chopped parsley, lemon wedges, garlic pepper, or grated Parmesan. You need the salt to bring out the flavor. The garlic powder brings out the flavor of the minced garlic better than the minced alone. The olive oil helps the noodles not stick together. If you like Alfredo Pasta, you'll like this easy, throw everything in the pot and walk away dish...with no butter!